Spring is here in London town so the florals and silks are out in force! It is this time of year that I often look to bloggers from warmer climates for some style inspiration for style inspiration, after all, the months of layering up in chunky knits makes it hard to imagine the best ways to wear lighter fabrics. When La Redoute contacted me asking if they could pair me up with a French blogger – Laura Loves Clothes – to share style tips, I jumped at the chance, and just like a virtual pen pal we’ve been exchanging tips on the best places to visit, and how to achieve that Parisian look! As the home of British fashion, and the location for most of the infamous fashion week street style photos, I chose to shoot this outfit post at Somerset House. It’s such a stunning location and exudes British style; it’s steeped in History, and the neo-classical building is situated in the heart of London, between Covent Garden and the Thames river. While us Brits tend to stick to a neutral dress palette, our Parisian fashionistas are not afraid of colour, so I decided to choose some pieces from the colour of the season; blue. It isn’t a colour that appears much in my wardrobe other than in striped nautical pieces, but the French are more fearless when it comes to fashion so I decided to go all out and mix together two blue shades for this look. The steel blue long sleeved blouse with a transparent top section is a fabulous piece for girls with a busy lifestyle like myself. All my outfits have to work for the office, and after work events so I love pieces which look smart and fashionable at the same time. I softened the blue by mixing with a pastel blue lace floral pencil skirt. The knee length skirt has a lovely fit thanks to the darts and is the ideal length for work and play. It’s a professional style but with pretty touches such as the scalloped trim on the hem and the floral lace overlay. For my accessories I chose a neutral silver shade, wearing my favourite new sandals from ASOS and this cute box bag from Topshop. 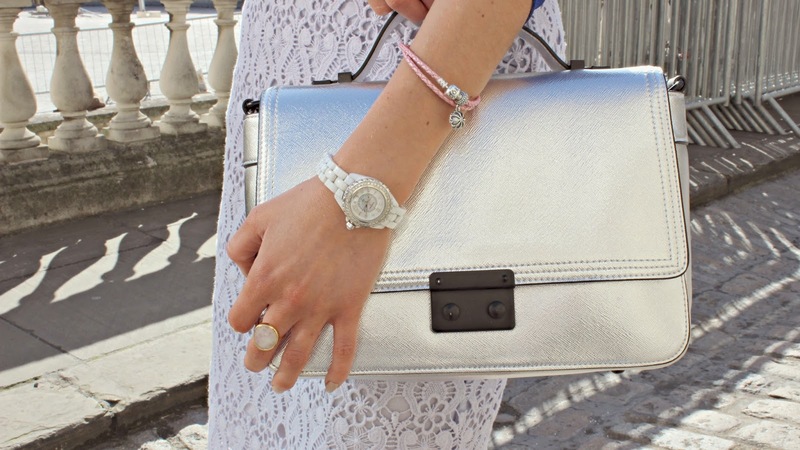 Adding some metallic hues makes this whole look a little more on trend, and my accessories are professional yet pretty; I chose my Chanel Watch, Monica Vinader ring and Pandora bracelet. A quick taxi ride away from Somerset house lies The Sanderson Hotel – my favourite place in London for Afternoon Tea. 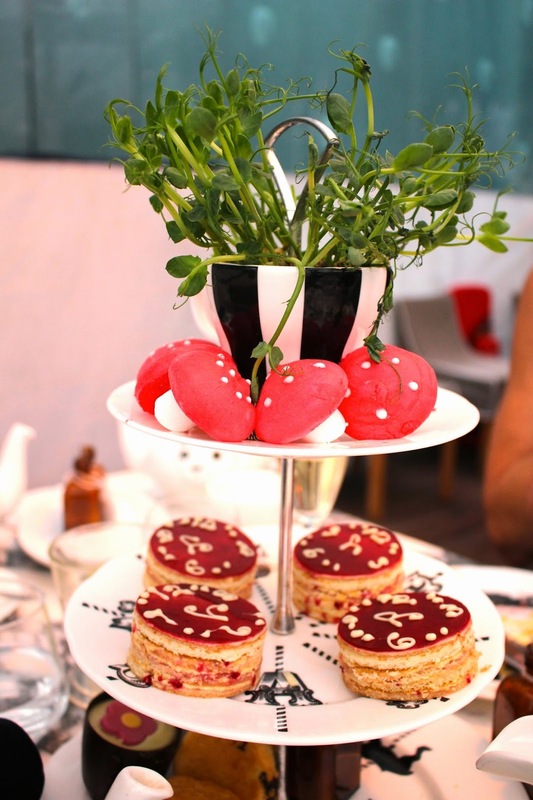 Once inside the hotel, you’re invited to ‘tumble down the rabbit hole’ to enjoy one of the most eccentric afternoon tea’s that London has to offer; the Mad Hatter’s Tea Party. You can enjoy the tea in the lovely courtyard space if the weather is nice, or in the woodland themed bar area. Its so easy to forget that you’re just steps away from the bustling Oxford Street! I reviewed the afternoon tea on the blog here where you can see loads more pictures! If you’re looking for somewhere to enjoy a quick drink, as well as stunning views of the city, right opposite Somerset House is the ME hotel, and up on the top floor is the Radio Lounge, with a balcony that overlooks Somerset House, the London Eye and the River Thames. I highly recommend their Pornstar martinis! If the cocktails have made you peckish, then head downstairs to STK ; the steak restaurant within the ME hotel where you should definitely leave room for dessert so that you can enjoy the Fairground Wheel of miniature puddings! You can see what my Parisian blogger pen pal recommends on the La Redoute Pinterest board here and find out more about the La Redoute Spring Parisian Postcode campaign here and via Facebook and Twitter! What are your favourite Parisian styles? ?